Chapter 7 Torbanite Mining at the Ruined Castle. This Chapter tells the story of the installation of the Bleichert Ropeway to the Ruined Castle Oil Shale Mines, the people involved, and the subsequent events after the collapse of the Ropeway. 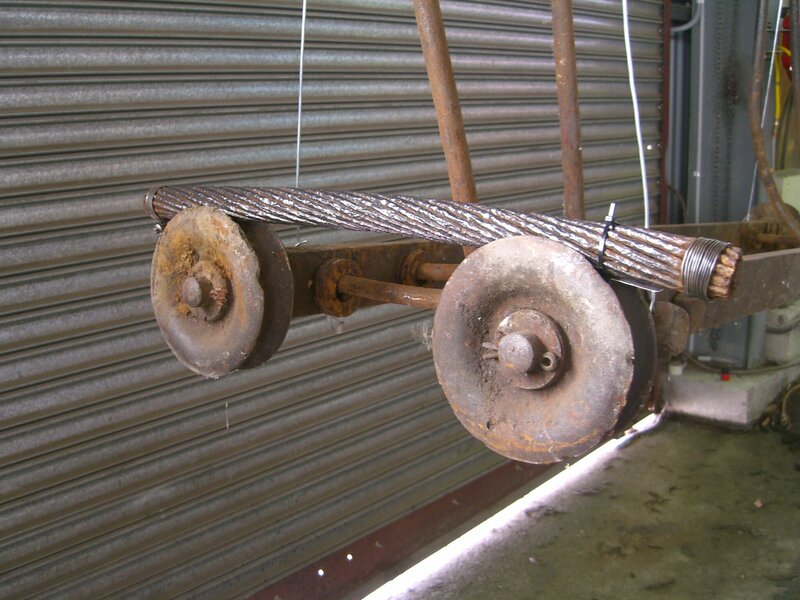 Further on ground research concerning rope ends and bar replacements with photographs. 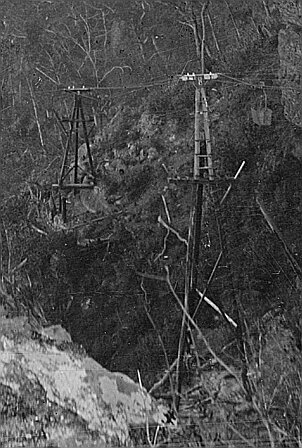 These items are located at the bottomof the cliff below the Northern Terminal of the Ropeway. Two remarkable photographs have come to light recently, one from the National Library and one from Powerhouse. 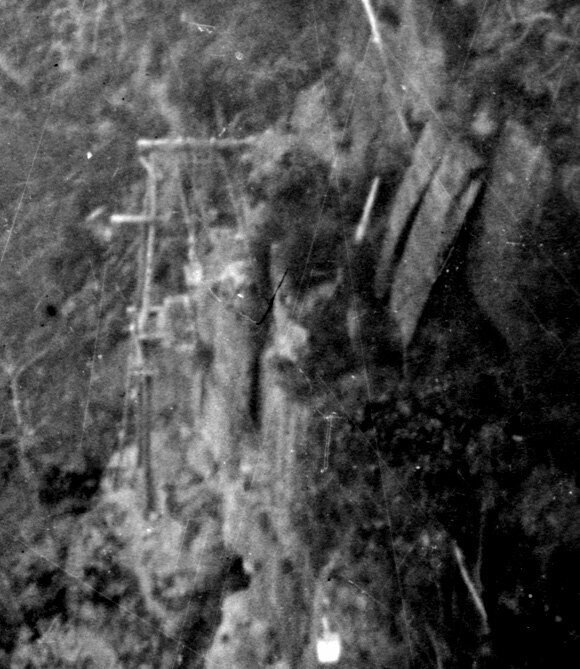 Analysis of this photograph has revealed much of the ropeway construction previously unknown. Tower No. 8 has had 20 feet added to its top, to reduce the angle of approach to the next tower on the cliff edge. 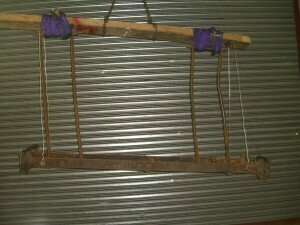 This was attempt to stop the buckets detaching from the haul rope and running away. Because of the steep angle the spider on the rope was slipping out from under the rope grip. Here is an enhanced enlargement of the towers 8 and 9 which are just above the white writing in the picture above. Tower 8 has had 20 feet added to its height. Three buckets can be seen on the ropes. The tower is remarkable. 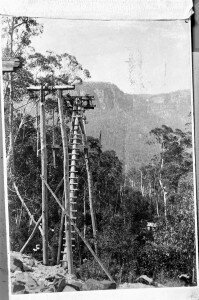 the outer leg is 60 feet high, two struts, each made of two 30 feet long poles one on top of the other, with a brace to the ledge half way up. On top is a large pair of cross beams anchored in the rock on the cliff side. A bucket and carrier can be seen just having passed through the tower coming towards the photographer. 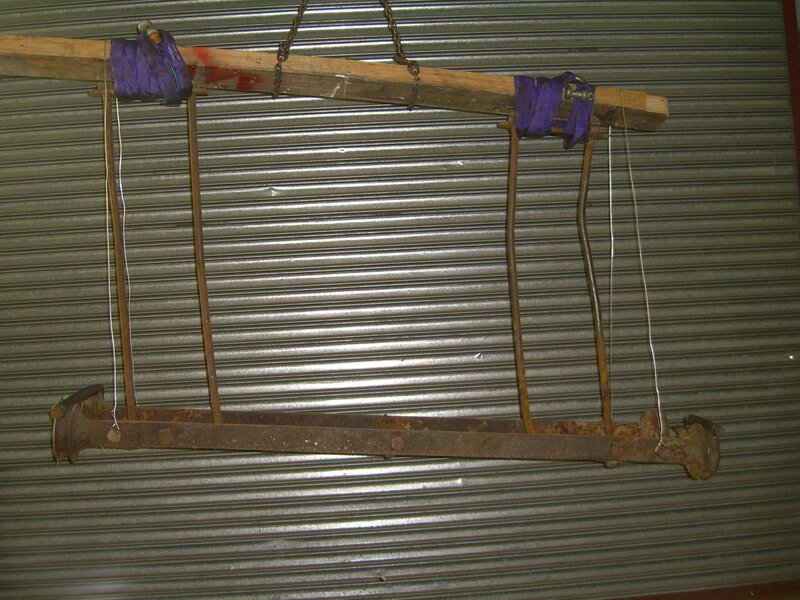 Hanging under the cross beams is a cross head, modified from the standard Bleichert double crosshead tower top. 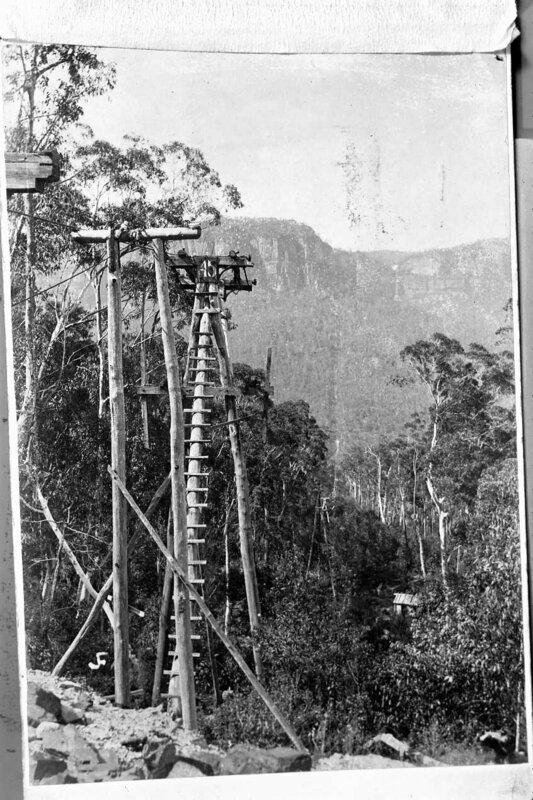 this crosshead is supporting the two track ropes, the one nearest the photographer is the inbye rope bringing the loaded buckets from the mine. It was 37 mm in diameter and had 32 wires. The outbye rope was 35 mm in diameter and had 19 wires. 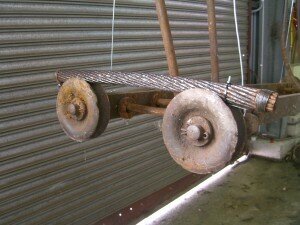 Here is a photo of the crosshead today, hanging from our gantry crane as it would have done from the cross beams. The second photograph is a “souvenir postcard” by Kerry from the Powerhouse Museum. 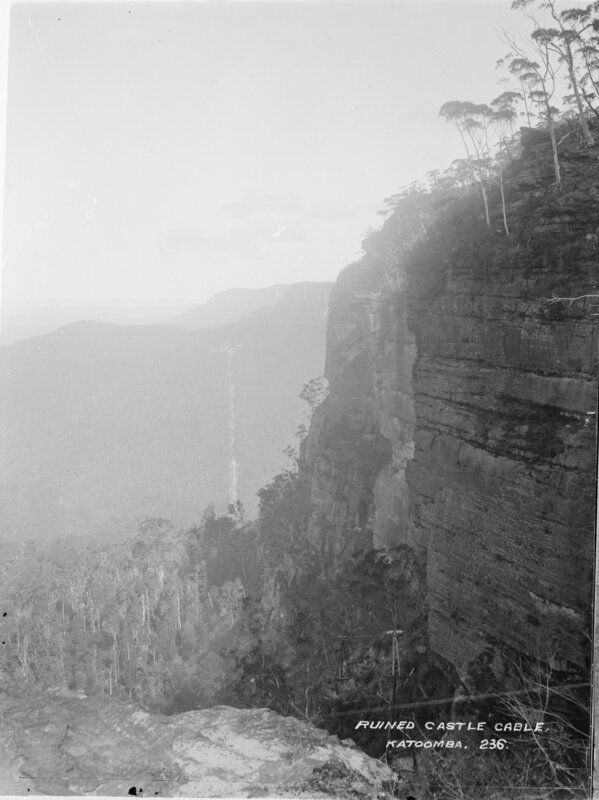 It was possibly taken on the same day as the stereograph. The interesting part of this photo is the clearing through the forest for the ropeway across the valley, visible to the right of the Orphan Rock. Buildings can be seen at the top of the clearing at the mine site. A big blow up reveals the small hut that can also be seen in a photo taken much later from the mine end. <<< The hut is there. A close look at the clearing shows no discernable change in the vegetation re-growth in the clearing, suggesting that the photos were taken at a similar time.